Last night, Secretary of State Hillary Clinton appeared on CNN, where she claimed “full responsibility” for security failures at the American consulate in Benghazi, Libya – security failures that resulted in the murder of our ambassador and three other Americans. 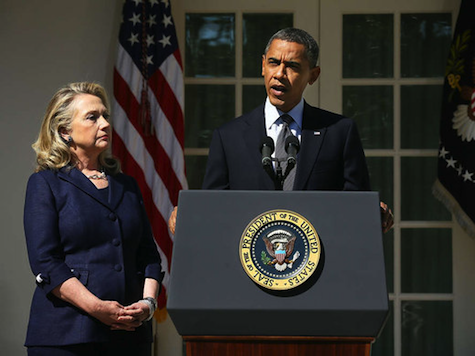 And last night, we reported that President Obama now had two choices: he could either stand by Clinton, and thereby claim responsibility for the security failures in Libya, as they were extensions of his “low profile” policy in the Middle East; or he could fire Clinton. Today, we got our answer: even as President Obama ignored questions from the press about Libya, his campaign press secretary, Jen Psaki, told Shep Smith of Fox News, “President Obama takes responsibility for the safety and security of all diplomats serving overseas.” In other words, Obama’s standing by Clinton. He’s standing by his cowardly foreign policy. And he’s taking responsibility – after a month, and just hours before the crucial second presidential debate – to try to stop the Libya issue from highlighting his weakness before the American people. There were many who questioned last night why Secretary of State Clinton would have claimed responsibility for the embassy security, especially after a month of silence on the matter. There are two theories. The first has Clinton as loyal soldier, taking a bullet for her boss in the run-up to the second presidential debate. Obama needed Clinton to take the bullet so that he could quash the story; the press, he figured, would let everything blow over once Hillary had come out and fallen on the sword. And Clinton went along with that plan to please Obama and set herself up as his successor in 2016. Then there’s the second theory. That theory states that Clinton knew that Obama was trying to blame the State Department for the Libyan cover-up. She was preparing for Obama to throw her under the bus. And she decided to act, stepping out front and seizing the initiative. After all, after her interview last night, who looked more presidential: the Secretary of State, or Barack Obama? By taking responsibility for the security situation in Libya, Clinton. pushed Obama between a rock and a hard place. He could either fire her, and lose her base of support before the election; or he could back her, and have to take responsibility for the single greatest foreign policy fiasco since 1979. She forced Obama to own his presidency. And in the process, she still came out looking like the stronger personality. The second theory seems to fit the facts far better than the first theory. Secretary of State Clinton has already announced she is retiring after the election from the Obama administration. She is clearly preparing for a 2016 run. The only thing that could hamper that run would be the stigma of association with the Libya debacle. By claiming the blame, and thus forcing Obama to out-do her, she put the blame squarely on Obama’s shoulders – and she made herself look like the adult in the room in the process. Brilliant. But Obama should take the blame. This is his administration. And the State Department was following his lead-from-behind policies in Libya. Tonight, Mitt Romney should hold him accountable before the American public not only for the lack of security for our ambassador, but for the subsequent YouTube video cover-up.